1:Download "VR Games" Apps or "3D Split Screen" Videos to your smartphone. Based on the game menu to select installation a video player or game software,test if it supports Left-and -Right split screen display and full-screen display. The QR code is in the first image our product page. Want to know more details? Please refer to the User Manual under this sentence. 12 Months Warranty: Since the day of purchase, please feel free to contact us when you need help. 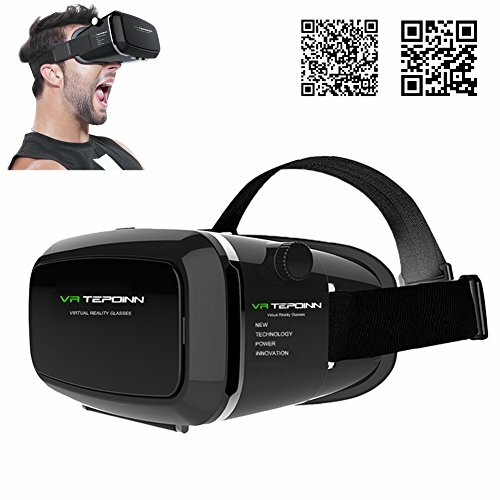 Smartphone turned into Virtual Reality Viewer: The ultimate 3D machine for 3D games and split screen movies, works with over 300+ iOS/android reality apps on apple and google play store. Adjustment: Pupil Distance (PD) and Focal Distance (FD) both can be adjusted to get the best 3D immersive experience. Heat Dissipation: The front cover is easy to be removed, it makes the phone cool while using and it is great for ventilation for long use. Compatible: Fits for iPhone, android phones and windows phones with screen size within 6.0 inch, recommended phone size is 4.7- 6.0 inch.